So this delicious looking recipe has been kicking around Pinterest for a while and, since I've been hiding away in my basement, doing revisions on my latest manuscript, my slow cooker and I have become even more involved than we usually are. To the point that Marc sometimes feels like a Slow Cooker Widower. I made it for the first time about a month ago and have gone through TWO bears of honey (ha) since. That makes this recipe a little more expensive than most but it's sssssooooooo good. Like, stab-your-partner-in-the-face-with-a-fork-for-the-last-bite, kind of good. So grab a pencil, write down the ingredients and check your cupboards. If you're missing anything, go get it. Then come back here and follow the directions. I've adapted this recipe, slightly, since the first time I made it and, let me tell you, the small adjustment is worth making. 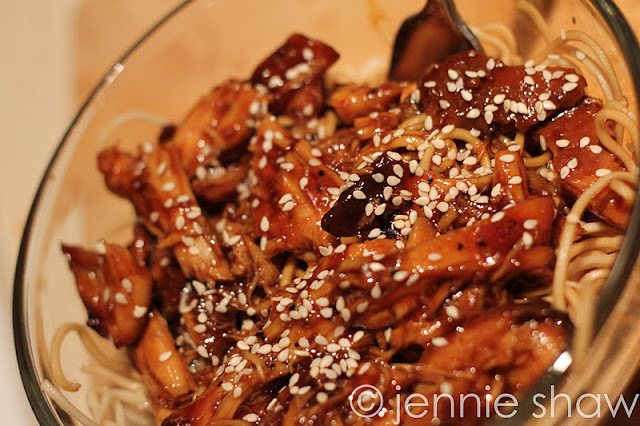 Not only is this recipe one of the best I've ever tried for homemade Chinese food, it's so easy that it will make you mad that you've been dishing out for delivery. So how was that for an intro? Ha! Take the honey, soya sauce, onion, ketchup, oil and garlic (and pepper flakes). Mix together in a bowl. Salt and pepper each side of the chicken breasts and lay them in the bottom of the slow cooker. Chicken Option 2: Hybrid with Orange Chicken directions. Cut up chicken into little pieces and toss with flour. Pan fry with a little oil until browned. I find that by adding the flour coating, the sweet, delicious honey has something to latch on to. It really locks in the flavour, in my opinion. Put whatever chicken option you choose to use in the slow cooker and then pour the honey-garlic mixture overtop. I find that 3 hours on high is perfect for Chicken Option 1 and 3 hours on low is perfect for Chicken Option 2. Toss with sesame seeds and serve over noodles (chow mien in this picture) or Jasmine rice. So yeah, there's a reason that this recipe is all over the place. I still can't believe how easy it is. Even with Chicken Option 2, the total prep time is under 15 minutes. Then with the noodles or rice, another 10 -15 after the chicken's done. Super delicious and incredibly easy. Looks yummmy! Will have to give that a try. This looks fantastic! I will have to try it!